What is the Heavy Duty RotaDairon® Soil Renovator™? Stones, clods, grass and debris present major problems when constructing or renovating sports fields and recreation areas or preparing ground for turf production. Quality and safety of all sports surfaces from golf fairways to sports fields are affected by surface stones. Germination rates and levelness of ground are also affected by clods and organic matter. The Dairon Company, in association with members of the golf and turf industry, has developed a wide range of machines which bury all debris to leave a surface free of stones, clods and rubbish. The roller frame supports the rotor by means of two depth control screw jacks. The reverse rotation rotor is equipped with special non panning blades which throw all the soil and stones against the selection grate. The stones, clods and debris land at the bottom grate of the cultivated depth to be covered with a blanket of fine soil 2 to 4 inches (5 to 10 cm) deep. 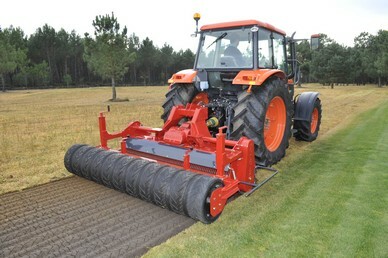 The finishing roller packs and levels the soil surface ready for perfect seeding or sodding.